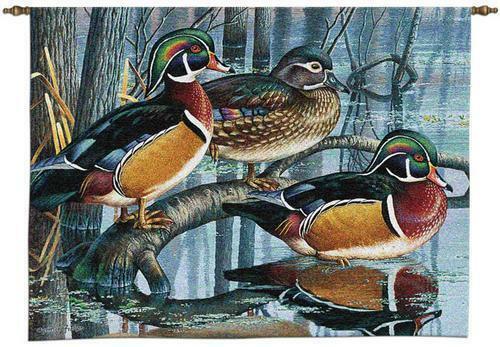 "WOOD DUCK Tapestry Wall Hanging" These colorful wood ducks wade in the edge of the marsh. Cynthia Fisher is known for her realsitc wildlife. This would make a great gift for any nature lover. It also makes attractive lodge decor. This high quality tapestry is woven on Jacquard looms. Includes rod pocket and weighted bottom for easy hanging. Cotton blend. Spot clean only. Measures 34" wide x 26" long. Note: Rod and Tassels not included with this item. May be purchased separately in my store. Request adjusted invoice for combined shipping when purchasing a rod or tassels with this item. On Mar-02-10 at 08:54:34 PST, seller added the following information: Shipping ONLY within the Continental U.S. Please contact for shipping quote before buying if you live in Hawaii or Alaska. PLEASE NOTE: Shipping ONLY within the continental U.S. Hawaii, Alaska, and Puerto Rico residents please contact seller for shipping quote before ordering.